The source of Kambo used by the IAKP comes from the original Matses tribe where the frog is treated very well. It is believed by the matses tribe that if the frog is harmed it angers the animal spirit that is so closely associated with kambo. The Kambo frogs are passive and allow themselves to be picked up. They are are unafraid of humans despite being harvested and once called from the tree can be seen crawling up the legs of humans. They are carefully tied by each leg with string, or ties made from plant matter. It is in not painful for the frog in anyway. The frog is naturally covers in the secretion which is gently rubbed off the skin. Sometimes the Matses rub the toe of the frog to produce more secretion. 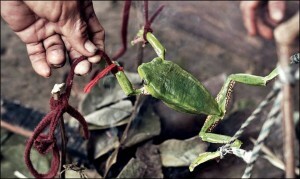 The frog is then released to continue living a healthy life in the jungle. It is not damaged in any way. Only the first layer of secretion is ever taken from the Kambo frog leaving it with some protection should it become attacked. It is considered that this source is ethically harvested and sustainable because the frog can be reproduce easily. In the above statement, I have described how original matses tribesman harvest Kambo frogs. There are a group of outcast Matses that have been exiled from the main tribe that do abuse the frogs by sticking metal sticks in the nose of the frogs to obtain more secretion. There are also tribes that blow smoke at the frog to antagonise and cause it to produce more secretion. The higher the commercial value of Kambo comes, the more untrained people are involved in the harvesting of Kambo and they only concerned with getting the highest yield from the frog leaving it defenceless against predators. IAKP practitioners do not agree or endorse this approach and choose to pay more for Kambo than to exploit the frogs in this way.